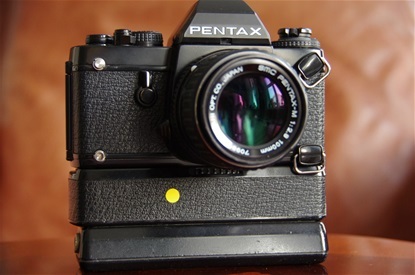 The only Pentax pro camera for 135 film ever, the LX. 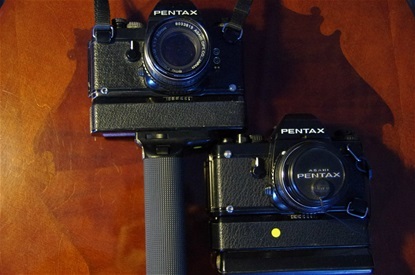 Note: Asahi Pentax released the 6x7 120 full system camera in 1969, a sensation at the time, and made for the pros. The camera has been upgraded several times since then, but not into a digital version. 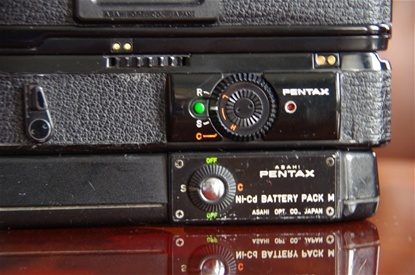 Pentax also released the 645 in 1982, also for the pros. 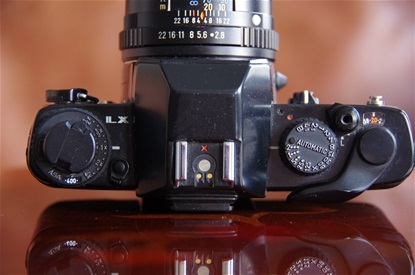 This camera was digitalized in 2010, and won the EISA award best professional camera in 2011. 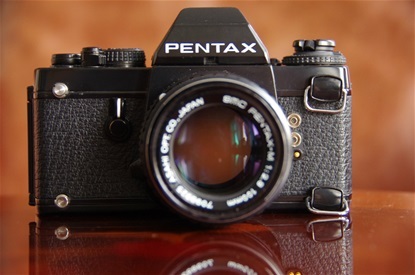 Pentax LX, roman for 60. It was launched 60 years after the foundation of Asahi Optical Co. This was the first dedicated professional 135 PP SLR camera from Asahi, so far aiming mostly at the enthusiast photographer. Interchangeable viewer, better sealing against water and dust, motors, battery packs, winders, extra grip and a variety of lenses. LX was produced without major improvements till 2001! Sn: 5268373. Full manual or automatic shutter. Different interchangeable viewers with release button to the left of the prism house. On/off button by the release button. 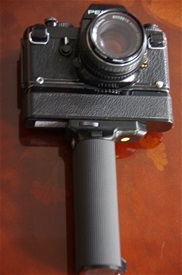 An LX (s/n 5325966) with Motor Drive LX (s/n 102896) and Battery Grip M.
The Motor Drive LX fires up to 5 frames pr second, but can be set to slower rythms by a dial on the back. Under is the Battery Pack M.
Motor drive LX (s/n 105859) and Ni-Cd Battery Pack M.